Dr. Mandeep Mehra believes the subject of the portrait may have suffered from an underactive thyroid, also known as hypothyroidism. When others gaze upon Leonardo da Vinci’s “Mona Lisa,” they may look at her mysterious smile or be surprised at how small one of the world’s most famous portraits is. But when Dr. Mandeep Mehra, a cardiologist and the medical director of the Brigham and Women’s Hospital Heart and Vascular Center, encountered the painting while on vacation in Paris with his wife two years ago, he also saw a potential medical diagnosis. In a letter to the editor recently published in the Mayo Clinic Proceedings journal, Mehra gave insight into a theory he developed after a year of research. He believes Mona Lisa may have suffered from an underactive thyroid, also known as hypothyroidism. “Frankly when I walked into the dedicated room in the Louvre just for this painting it was a morass of people,” Mehra said. “There were I would say hundreds and hundreds of people. Standing in the back of the room behind the crowd, Mehra used a pair of borrowed binoculars to look at the “Mona Lisa.” He later took a closer look at the Italian woman’s thinning hair, yellow skin, and later considered the puffiness of her neck as well as a larger swelling on her right hand. Mehra began to find corroborating evidence by tracing back all the harvests for three or four hundred years to see how many periods of famine there were in that region. In his analysis, Mehra found other paintings that seemed to show subjects with similar symptoms, such as in “The Crucifixion of Saint Andrew,” from 1607 by Caravaggio, where there is a poor old lady with a goiter or enlarged thyroid gland on the left lower part of the painting. There appears to be a similar swelling on the neck of Judith in Artemisia Gentileschi’s painting of “Judith and Her Maidservant” from 1613. Terry Jopke, managing editor for Mayo Clinic Proceedings journal, said Mehra’s letter on the “Mona Lisa” was atypical, as most letters to the editor tend to reference previous articles. “His article seemed particularly interesting as a medical interpretation of classic artwork,” Jopke said. Mehra knew that researchers, including rheumatologists and endocrinologists, had suggested in 2004 that skin lesions and hand swellings visible in the portrait may have been a sign of a lipid disorder and heart disease and could have been the cause of Gherardini’s death. 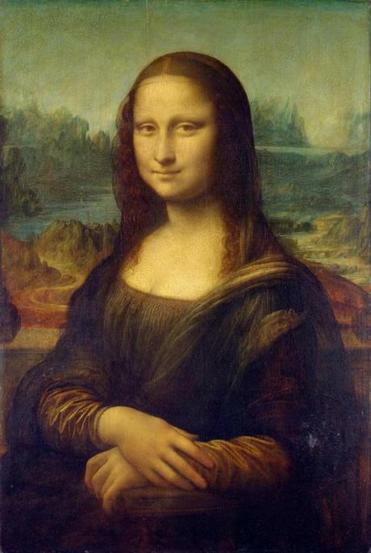 They also proposed that Mona Lisa’s smile may simply be her face drooping from a case of Bell’s palsy. Mehra believes that an underactive thyroid resulted in a weakening of Mona Lisa’s face muscles and created the unique expression. He believes Gherardini would not have lived to be 63 if she had the more severe disorders that these researchers suggested. Dr. Matthew Drake, an endocriologist with the Mayo Clinic, referenced Mehra’s findings in his own article on hypothyroidism in the same journal. Drake describes having an underactive thyroid as everything in the body moving slowly. Cristela Guerra can be reached at cristela.guerra@globe.com. Follow her on Twitter @CristelaGuerra.